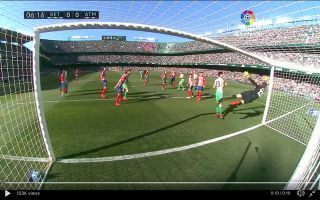 Atletico Madrid superstar Jan Oblak showed off cat-like reflexes this afternoon to deny Real Betis from scoring, the Slovenian pulled off one of the saves of the season. Oblak made the spectacular save just six minutes into the La Liga clash, Betis defender Zouhair Feddal headed towards goal from a corner and just as the ball looked like hitting the back of the net Oblak clawed the ball away. Oblak has established himself as one of the world’s best goalkeepers in recent years and on a day where David De Gea will also be lauded for his heroics, it’s fair to say that the Slovenian comes out on top with his insane reflex save. That is easily one of the saves of the season. Oblak produces miracles and that was up there with his top career saves. Has so little time to react and manages to get his hand in the top corner. What an incredible save. Massive save! Best of the season! Best keeper in the world. Simple.